Notes: 95% confidence intervals indicated by error bars. Age-adjusted, using the subpopulation of persons aged ≥18 years with hypertension during 2011–2014. Respondents were defined as having hypertension if their systolic blood pressure was ≥140 mm Hg or their diastolic blood pressure was ≥90 mm Hg, or they were currently taking medication to lower high blood pressure. Data Sources: Nwankwo T, Yoon SS, Burt V, Gu Q. 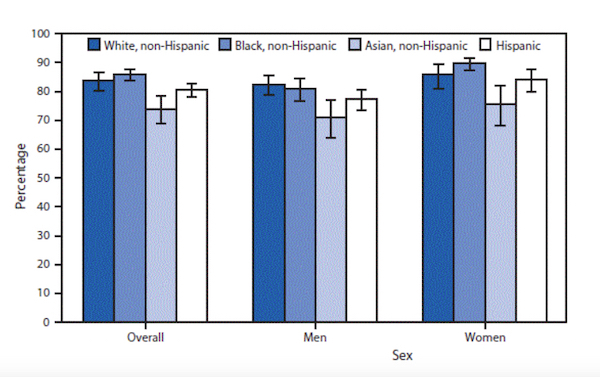 Hypertension among adults in the United States: National Health and Nutrition Examination Survey, 2011–2012. NCHS data brief no. 133; 2013; CDC. National Health and Nutrition Examination Survey data. Hyattsville, MD: US Department of Health and Human Services, CDC, National Center for Health Statistics; 2013–2014. This entry was posted in Medicine and Society Data Watch on June 1, 2016 by Christopher Barbey.